The Regulatory Reform (Fire Safety) Order 2005, in force since October 2006, was brought in to ensure the safety of anyone working in or visiting commercial premises and common areas of residential blocks. The government’s guidance accompanying the Order incorporates a checklist of five key steps. These include the need to identify escape routes. Fire doors form a crucial part of this requirement, as of course it is vital that escape routes are protected from fire. There is clearly a lot that goes into making a fire door, and it is vital that the doors are assembled and installed with precision accuracy to ensure they meet the stipulated requirements. What do fire resistant doors consist of? 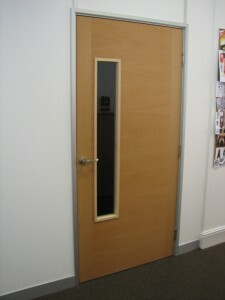 Fire door sets consist of various parts. The main door itself is usually constructed of solid timber. This can be veneered to produce an attractive finish that is consistent with the décor of the building, providing the veneering complies with the required standards. Any glazing must be fire resistant, and the doors must function to control the spread of smoke as well as fire. Smoke seals need to be fitted carefully so as to avoid preventing the full closure of the door. To prevent hot gases passing through any gaps between the door and its frame, the doors need to be fitted with what are known as intumescent seals. These are inactive until such times as they come into contact with heat, at which point they expand and seal the gap in order to contain fire and smoke. Fire resistant doors must be fitted with automatic closing devices and when it comes to the hardware, everything must be fire rated standard. All fire doors must also be fitted with the appropriate signage, as per the Health & Safety (Safety Signs and Signals) Regulations 1996. When closed, fire doors are required to provide resistance to fire or smoke for a minimum timeframe. Standard timber construction fire resistant doors will usually offer 30 minutes of resistance and are known as FD30 fire doors. It is also possible to have doors that provide 60 minutes of protection, and these are accordingly known as FD60 fire doors. Because fire check doors are highly specialist, it is recommended that they are fitted from new rather than attempting to upgrade an existing door to meet compliance standards. Read Veneers have been producing bespoke veneered fire doors for more than two decades. Whilst they are a legal requirement, there is no reason why they cannot look appealing and complementary to the interior décor. We offer fire check doors and full door sets in a variety of finishes. For more information please visit our dedicated fire doors page or get in touch for a consultation and written quotation.